CULLMAN, ALABAMA --TSE Brakes, Inc. is introducing TSE-REX™ (Rapid EXchange Push Rod system) with VCT™ (Variable Clocking Technology) that features easier installation, better chamber sealing and fewer necessary model numbers. TSE-REX is patent pending and the VCT technology is patented. TSE partnered with Consolidated Chassis Management (CCM) in developing this product. CCM currently has about 130,000 chassis under management at pools throughout the country. “With so many chassis, maintenance is a key cost driver for us. We are continuously analyzing data to determine root causes of our maintenance spend. We identified bent push rods as one of those root causes. TSE Brakes listened to our concerns and worked with us to develop this new game changing design,” said Jon Poelma, Chief Operating Officer/ Senior Vice President, CCM. With TSE-REX with VCT you can reduce inventory costs, reduce installation labor costs and reduce installation errors caused by manually cutting rods. “It is all about safety, inventory control and maintenance best practices. The TSE-REX system helps prevent errors caused by manually cutting rods to the incorrect length. Our technicians are trained to pull the correct combination of push rod components, and quickly install the right unit,” stated Jim Reo, Director of Maintenance and Repair, CCM. 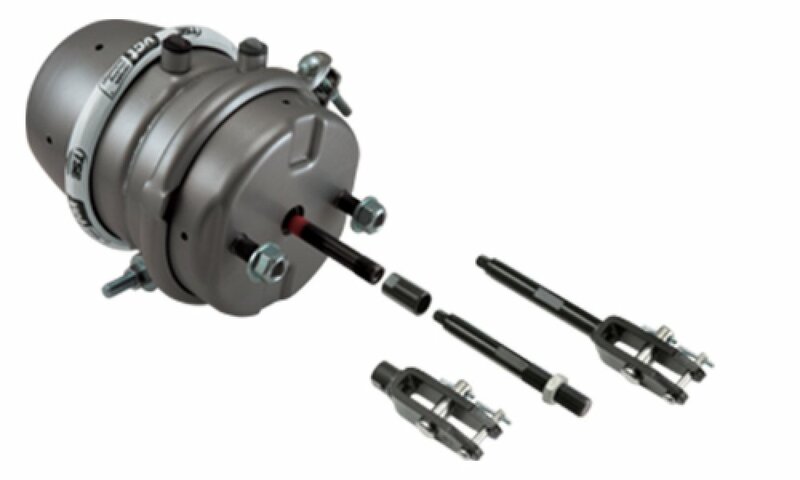 “With the VCT, you can freely spin the ports during installation and then secure with one bolt. Not only does the feature save time with installation, but it also allows our customers to stock fewer models because the port locations are now variable instead of left hand or right hand,” remarked Jean Gregoire, Vice-President Sales & Marketing,TSE Brakes. “This also helps eliminate hose chaffing, which is a potential citation, as well as the additional cost savings when it helps eliminate the need to replace hoses because of chaffing,” added Martin Summers, General Manager - Maintenance Administration, CCM. Our customers told us that at times air brake actuators are less efficient because they are not always properly sealed by the installer. The beauty of the innovative VCT design is that we factory seal the diaphragm, so the installer is no longer required to get the best possible seal,” Jean Gregoire continued.